Lisa loves John: Five on Friday! Happy Friday!! Keeping it short today, and linking up with Christina, April, Darci, and Natasha! 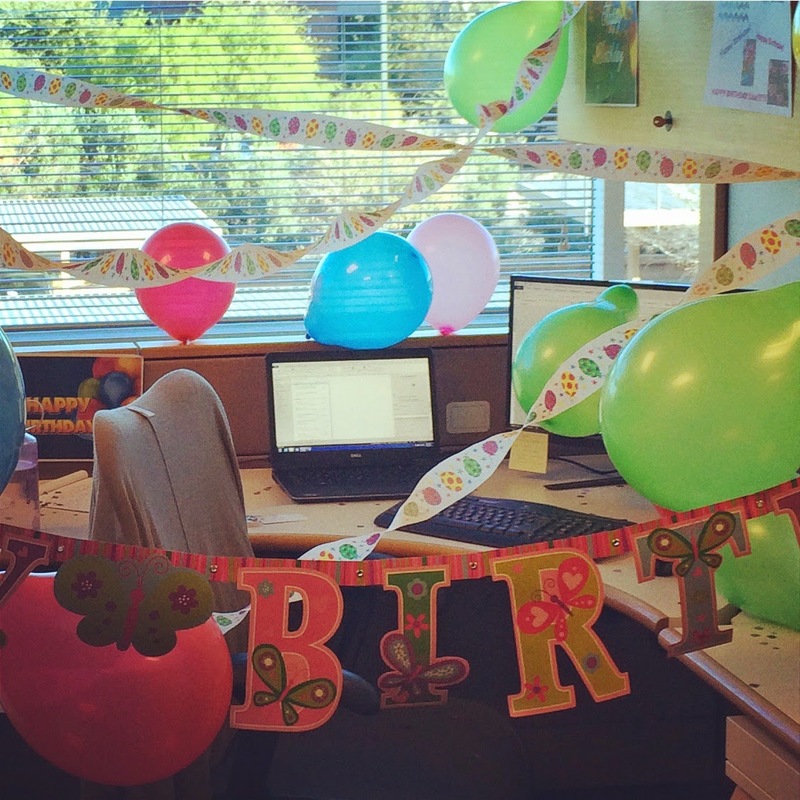 It is my birthday this weekend and my sweet coworkers decorated my desk! I'm not going to lie, I was actually pretty surprised... it was super thoughtful! Have you tried this stuff?! It's amazing, and I absolutely love how it applies. AND, the colors are fabulous... lots of nudes that are perfectly opaque - just how I like it! You've got to check it out! I'm going to my first barre class with a friend tomorrow, and I have zero dance experience... please comment and leave me all your tips so I don't look like a total fool!! Ahh!! 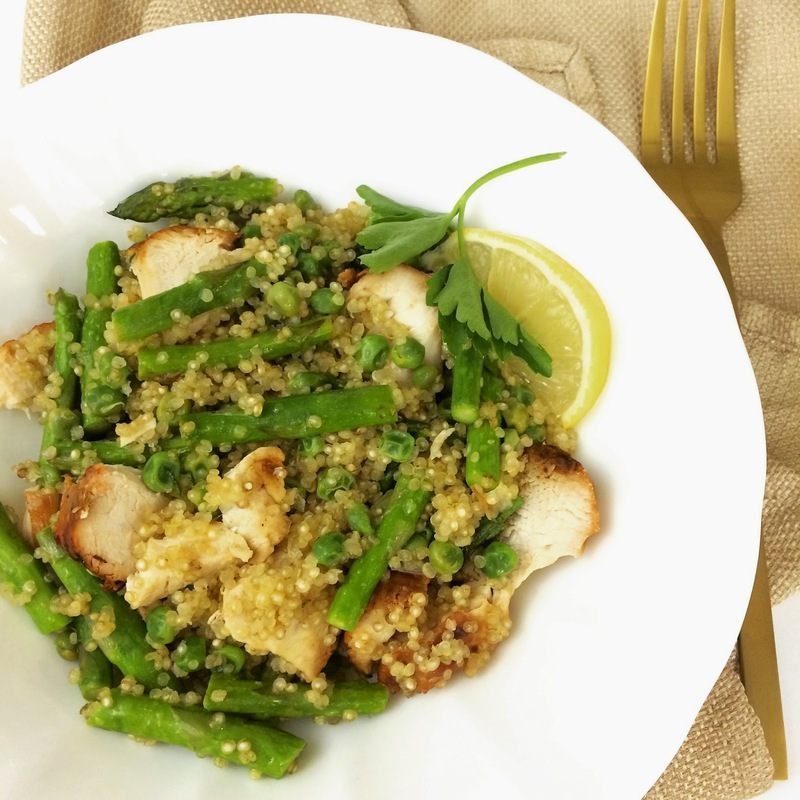 John and I have started back up with meal planning, and one of our meals this week was a delicious warm quinoa and chicken salad with peas and asparagus - soo yummy!! Recipe on the blog soon! Happy birthday!!!! Have a great weekend! PLEASE give us an update after barre :) ...I've been so curious about it! Can't wait for that recipe! I'm on a total quinoa kick. Happy Birthday!!! Enjoy celebrating this weekend! Happy Birthday, pretty lady! We decorate cubes at my work too and it's so fun!!!! That salad looks really yummy! Have fun at barre! I hope you have a fantastic birthday!! i hope you have a lovely birthday!! that's so thoughful of your coworkers! Happy Birthday!! Hope you have a good weekend celebrating! Happy Birthday Girl! Hope you enjoy your day! I've so been dying to dry a barre class, hope your first one is good, I don't think you have to worry about not having any previous dance experience! Yay for surprise birthday shenanigans! 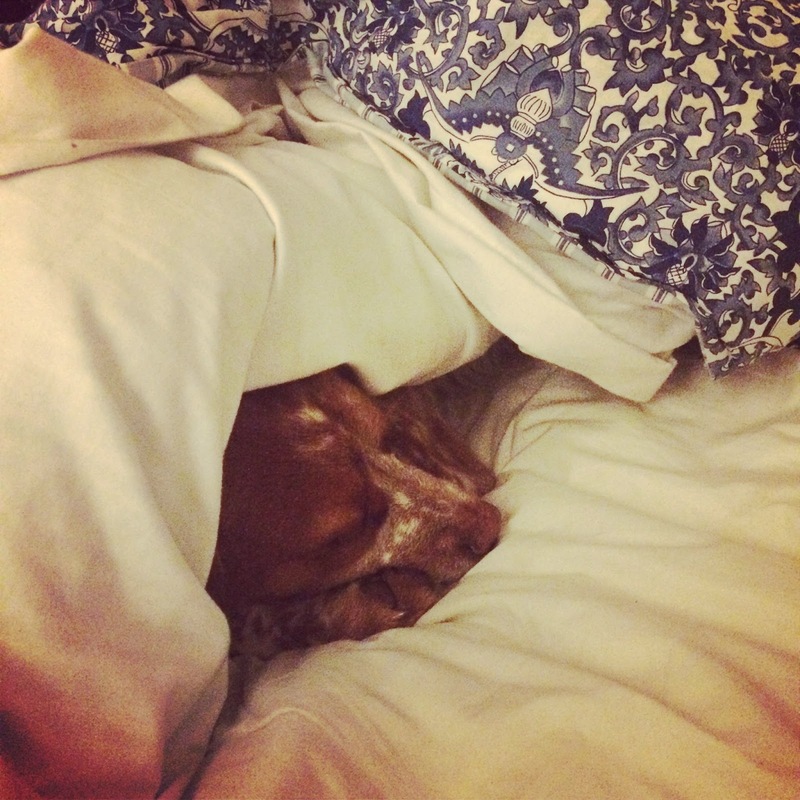 :) I don't blame scout for staying under the covers. I feel like doing the same thing everyday! Lol. Happy Birthday, pretty girl! Happy Happy birthday! And that nail polish definitely looks amazing. Going to have to give it a try! Hope you have a wonderful weekend! Aw happy birthday lady! I hope you have a wonderful weekend! Have fun at barre. I've never tried but really want to. Haaaaaaappppy birthdayyyyyy!!!!!! Also, that quinoa salad looks delish! HAPPY BIRTHDAY!!!! Let us know how barre is!! I just won three free class passes so I cannot wait to try it out! Happy Birthday! Your co workers are so sweet! My Scout is the same way! Have an awesome birthday weekend! I've been seeig stuff about this BARRE thing...not quite sure what it is, but I'm super interested in reading more!! That salad!!!! WOW! Happy early birthday! I love all of the balloons and streamers, so sweet of your co-workers! That recipe looks delicious, I'm always looking for new wants to use quinoa- I can't wait for the recipe. And I can't wait to hear about your barre experience, I want to try it out so bad! Happy Birthday week! Thanks for sharing that nail Polish, I really want to try it. I am still recovering from my holiday shellac, but I think I'll be ready to start painting my nails again soon. Also, you guys are making some awesome food! HAPPY BIRTHDAY WEEKEND!!!! :) hope its amazing. Don't you love when co workers recognize it? So amazing.... can't wait to hear what you get into! I loooove quinoa, I may have to snag this recipe!! Happy Birthday! Scout looks so cute and good luck at your barre class! Hope you have a great weekend! Barre is something I have always wanted to try, but I am afraid to like it because classes are so expensive around here!!! I hope you have a fabulous birthday weekend!!!! Hope you have a fantastic birthday! So sweet of your coworkers! Can't wait for the recipe! Hope you had a fabulous birthday weekend, that was so sweet of them to decorate :) Can't wait to hear your thoughts on your first barre class! Five on Friday: My Favorite Things! New Year's Resolution Food... Zoodles!